Paper clutter can be costly. Late payments, misplaced birthday invitations, missed cancellation notices can all happen when your home is full of paper clutter. This is one area where I really struggle. It seems that no matter how hard I try to stay on top of it, all it takes is a week of neglect and it is overwhelming again. Not only is paper clutter costly, it is messy. Piles of papers really do make a house feel disorganized. Even organizing the papers in baskets, files, binders, or containers can make a big difference in how your home looks. Here are a few ways I try to control the paper clutter. Online banking: I pay my bills on line and have them delivered electronically to reduce mail and paper clutter. 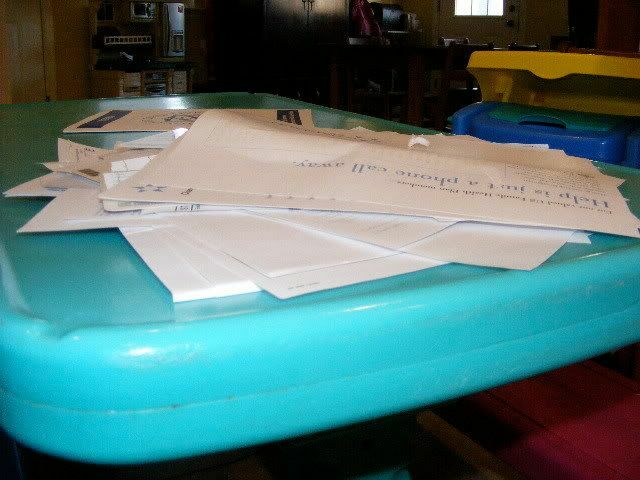 Sorting mail over the trash can: I usually stop at our trash can/ recycle bin before I even go into the house with our mail. I immediately throw out or recycle any junk mail that does not have identifying information on it. Do not sign up for mailing lists: Except for my free sample experiment, I never sign up for free trials or samples of anything. These things always seem to come with mounds of other junk mail and papers that need to be filed, mailed, or thrown out. Usually when you order an item you have the option of opting out of the free catalog. My advice is opt out. Sign up to be on the Do Not Mail List: While this list doesn’t guarantee you will not receive any junk mail, it reduces the amount of junk mail you receive. You can sign up for Opt Out Prescreen to be removed from credit offers. Live Debt Free: I realize this is not something everyone can do right away, but living without debt is a great way to reduce your paper clutter. No debt, less bills! Pick it up once: I learned in a time management class years ago, that if you don’t deal with something the first time you pick it up, you touch it 40 more times before you take care of it. What a waste of time! Create a system for paperwork and set aside time each day, week, or month to stay on top of clutter. I use the binder system to organize paperwork. I’ll explain how it works for me tomorrow. Have you ever paid a late fee because of a misplaced a bill? Have you ever lost a receipt, only to find out after the return period is over? I have! I am trying to get control of the paper clutter in my house, are you? Ugh. Paper clutter is my nemesis. I have *such* a very long way to go. 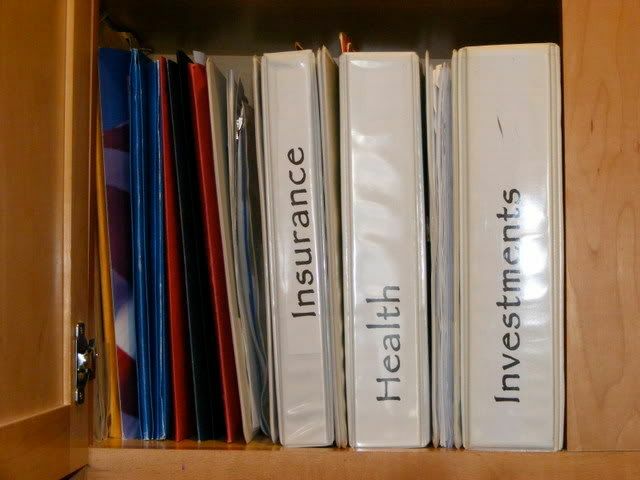 But last summer, I implemented your binder idea for organizing the paperwork that goes along with renting out our Michigan home as a vacation rental. It works so very, very well… and it made tax time *so* much easier! Great post. Paper clutter is such a hard one to get a handle on. I look forward to your next post! Paper clutter is my BIGGEST organization problem! Today I was so proud, I actually filed/tossed all the mail within 5 minutes 🙂 Can’t wait to read all of your tips! What bothers me is all the charity appeals! We give a fair amount of money away, so I guess we’re on a bunch of lists. And I was always a sucker for appeals, giving $20 here and $20 there. No more. It just leads to too much mail! Ugh. Paper. Being a teacher I feel like I’m buried in it at work and home! My solution is to get a shredder and shred away. I also scan in those documents you need to hold on to but may not actually ever need again (like IEPs for my special ed son, etc). I’m working paying off debt free. Paying off a bill makes my life a lot easier in many way! Mine biggest problem is getting the bills together then paying them then filing which takes place in 3 different places so I tried the bin, the book, the folders now I am back to the bin and file needed p/w in the files and the books I keep is for projects or places. paper clutter is my biggest problem Im a minimalist in every other area of my home and life the paper part I cant seem to grasp. Paper clutter is one of my biggest problems as well! Thanks for informing me about the Opt Out Prescreen… I’ve never heard of this. I’m signing up ASAP! This is one area where I struggle too! I’m excited to hear more ideas on how to control the paper coming in and going out of my house! Great post! It really bugs me when paper clutter builds up around my house! I am so a binder kind of girl, we are in the process of buying our first home and we have paper galore that we have had to print off…. can you guess where I am going this after noon…. yep adding one more binder to the system. Although I’m not sure why I never thought of using binders for more than my planner… it works so well for that and keeping me organized, lol!!! Inexpensive Binders: Try your local thrift store–Salvation Army store, church thrift store, etc. I’ve purchased 3 ring binders in good condition for $.50 each. A little alcohol on a cotton pad can clean them up if needed.